Cortical stroke impairs long-term memory in mice. 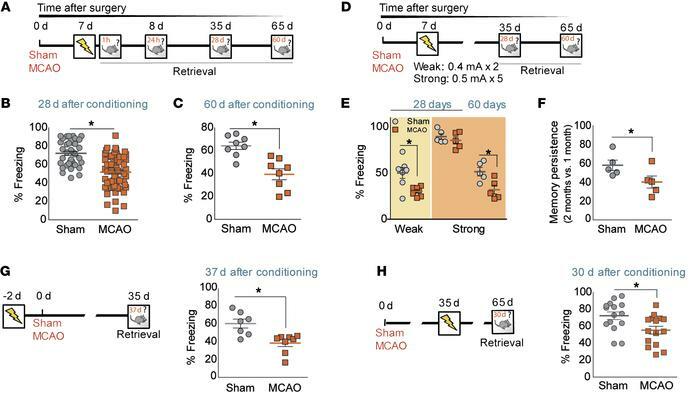 (A) Experimental design for panels B and C. Sham-operated and MCAO mice were subjected to CFC (0.6 mA × 3) and tested 28 and 60 days after training. (B and C) Remote memory retention after cerebral ischemia calculated as the percentage of freezing response 28 days (B, P < 0.05 vs. sham operated; sham operated, n = 37; MCAO, n = 63) and 60 days (C, *P < 0.05 vs. sham-operated group; sham operated, n = 8; MCAO, n = 8) after foot shocks. (D) Experimental design for panels E and F. (E) Percentage of freezing in control and MCAO groups after a weak (0.4 mA × 2; left columns; light orange panel; *P < 0.05 vs. sham-operated group; sham operated, n = 7; MCAO, n = 7) or a strong fear-conditioning paradigm (0.8 mA × 5; right columns; dark orange panel; P > 0.05 vs. sham-operated group; sham operated, n = 5; MCAO, n = 5). Retention for both types of conditioning was performed 28 days after training and 60 days after conditioning for the strong one. (F) Memory persistence at 2 months after strong fear-conditioning paradigm. Data are represented as percentage of freezing at 2 months versus that observed at 1 month (*P < 0.05 vs. sham-operated group; sham operated, n = 5; MCAO, n = 5). (G and H) Freezing response after conditioning (0.6 mA × 3) performed 48 hours before surgery (G, *P < 0.05 vs. sham operated; sham operated, n = 9; MCAO, n = 7) or 30 days after MCAO (H, *P < 0.05 vs. sham operated; sham operated, n = 15; MCAO, n = 15), respectively. Data are represented as mean ± SEM. Data were compared using nonparametric 2-tailed Mann-Whitney U test.